CHALLENGE: Restarting and modernising a dormant, once thriving lubricant business in Eastern Europe. SOLUTION: Investing in manufacturing high-quality products at a reasonable cost using NYNAS T110 and NYNAS T600. RESULT: Greases with excellent properties compared to previously used Group I oils. The history of the Berdyansk plant in southeast Ukraine dates back to 1937, when the first aviation fuel was produced at the facility’s cracking plant. For many years, it was a leader of the lubricant industry in the USSR and Eastern Europe. But as the economic and political situation in Ukraine changed in the years following independence, the plant was involved in political intrigues and corruption schemes. 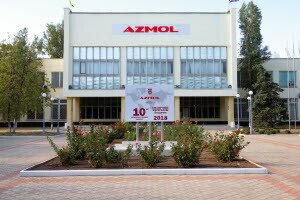 By 2015, Azmol, a once prosperous enterprise, had accumulated large debts and went bankrupt. Manufacturing stopped, divisions were closed and facilities sold as scrap metal. The workforce shrank from more than 3,500 to only 150 workers. However, new life was brought to the plant as it was privatised and British investors came onboard in 2016 – Azmol British Petrochemicals (BP) was born. Following significant investments to restore and modernise the plant, as well as to recruit and train new staff, the first shipment of oils and greases was dispatched in April 2017. Manufacturing is based on advanced technologies, and the new research and development division and the laboratory work intensively to test and refine the product slate. The aim is to provide the Ukrainian and foreign markets with premium motor oils and lubricants. Nynas has worked with Azmol for many years, and with the reorganisation of the company this partnership was renewed and further developed. Collaborative work between Azmol BP’s Technical Department and Nynas Ukraine has maximised the economic benefit from the use of naphthenic oils. Darya Dudko notes that Nynas’ reliability, high quality standards and flexibility of supply were other deciding factors in selecting them as a partner. In the future, Azmol BP hopes to increase their purchases of Nynas products and their range, maximising the use of naphthenic oils in its lubricant compositions. “We have also signed a purchase contract for NYNAS T22 oil for Metal Working Fluids, another area where we see advantages in Nynas’ products over Group I oils,” says Andrey Yashchenko, Chief Technology Officer. Azmol British Petrochemicals has been manufacturing highquality oils, lubricants and various cutting fluids for more than 80 years. An industrial leader in Eastern Europe, after a period of decline the company was reborn in 2017 with a focus on modernisation of production, product improvement and international expansion. Its Berdyansk plant in Ukraine currently has 384 employees and annual production of over 10,000 metric tonnes of lubricants and other oils.